For almost six decades Montreal’s fabled underground city has been an inspiration to civic planners from around the world. What began as a subterranean pedestrian network beneath Place Ville Marie is now an integral part of the city and a major tourist attraction. It has developed into a parallel metropolis, an amazing labyrinth of passageways, alleys, atriums, and hallways that snake their way along 40 km, connecting 85 downtown skyscrapers, ten hotels, 2000 stores apartment blocks and 68 Métro stations. Alan Hustak looks at its history, takes you on a personal tour of the multi-level environment, and reveals its many hidden surprises along the way. Like the city above ground the underground city has its own mix of sun and shade, public squares, fountains, green spaces, and even an indoor skating rink. It is not so much an underground city—that’s a misnomer—as it is an enclosed, weather proof city: a climate-controlled environment, above and below ground that is air-conditioned in summer and warm against the blast of winter. 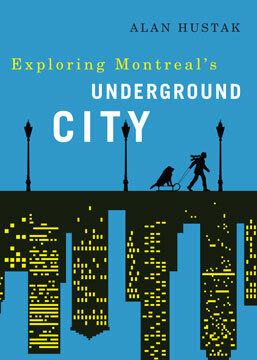 For Montrealers and visitors alike, Exploring Montreal’s Underground City is an indispensable guide with tours, maps, and indexes, and full colour photographs. 140 pp 7" x 5"